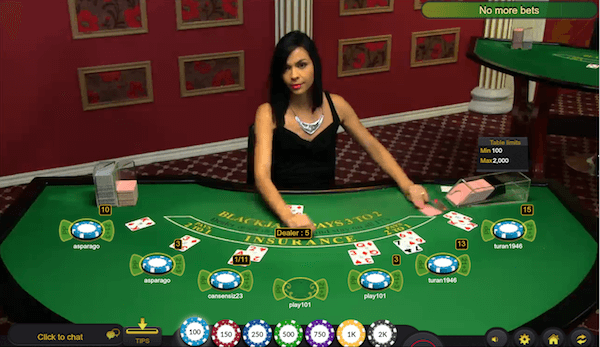 One of the most popular games that is currently played for bitcoin is blackjack. That’s not really a surprise given how crowded tables of this game are at brick & mortar casinos worldwide and at FIAT currency online casinos. If You are looking for a complete guide to playing this game online and doing so with BTC, this is the right place. We have recently recreated content on this page to include answers for frequently asked questions by our visitors as well as those we had ourselves. What’s The Difference Between Playing For Bitcoin And FIAT? There is none, apart from the fact that you will be depositing, betting and winning bitcoin. Truth is that software companies that provide solutions to regular online casinos also work in this niche. We are talking about ones like MicroGaming, Net Entertainment and BetSoft Gaming that are already well established. The RTP’s (return percentages to players) are still the same, regardless of what currency you play in. We do suggest avoiding some of those “homemade” bitcoin casinos that are neither tested or licensed to operate. If you choose a site like Cloudbet or 7Bit Casino there is absolutely nothing to worry about. All casinos offer bonuses, but it is very rare to find sites that allow their players to use those bonus funds on blackjack. Normally this game is completely excluded from the wagering requirements because of the low margins (meaning casino has only a tiny advantage). There still are some casinos that offer bitcoin blackjack bonuses though. Most of them will count a small percentage of all wagers made on this game towards fulfilling the requirements. Let use an example below to make sure that you understand how this works. Casino X offers a 100% bonus up to 1BTC and you claim it in full by depositing a bitcoin. They ask you to wager 50 times the bonus amount (total of 50BTC), but blackjack wagers only count as 10% of their total value. What this means is that to clear the whole bonus playing blackjack, you will need to wager 500 bitcoins. When we say wager, we simply mean stake this amount of money on the tables by betting it. We have researched the terms and conditions of our partner sites and above is a table with bitcoin casinos that allow playing blackjack to clear their bonuses. The two most popular side-bets that you will stumble into are perfect pairs and 21+3, which is based on the combinations of poker. Truth be told, these and pretty much all side-bets usually offer very bad odds for the player and a significant house advantage. Perfect pairs offer a chance to predict whether the first two cards dealt for you will be paired, suited or both. This side-bet features a house edge of 4.1% according to various sources, including the information available at Ezugi live blackjack tables that offer it. 21+3 side-bet gives you chance to mix blackjack with poker. It’s all about making poker-like combinations with the first two cards dealt to you, plus the first one for the dealer. Combinations such s three of a kind, three suited cards (flush) and three consecutive cards (straight) are rewarded with a payout. While this bet might seem compelling thanks to a high stake to payout ratio, it features a house edge of 6.29% and offers one of the worst winning chances of all blackjack bets. Simply put the house edge represents a mathematical advantage held by the casino, often referred to as “the house”. When you place a $100 wager at a blackjack game that pays back 95.5%, you expect to lose 50 cents every time this bet is placed. Pretty much all serious companies operating bitcoin casinos recognize the enormous potential when cryptocurrency and live dealer technology are both connected. Since the early days pioneers of this niche BitCasino.io have been offering bitcoin live blackjack from Ezugi and Quickfire. For a full recap on games, betting limits, usable devices and restricted countries visit our live dealer section. 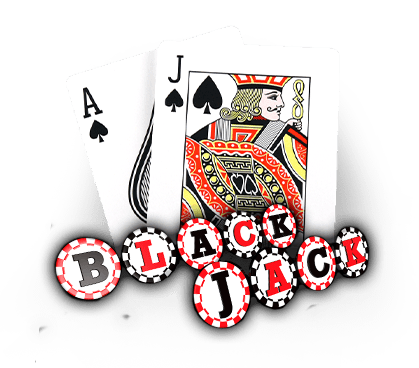 If you’re looking for live blackjack specifically, we have a dedicated page on that here. Live Blackjack From Ezugi (US welcome). Find casinos that offer a chance to play with Carolina below. There’s no strategy that will help you beat the house, period. Having that said, we absolutely suggest following the basic strategy. Instead of going into detail about what to do in certain situations, you’ll find a chart for that below. Apply this strategy when playing blackjack. If you cannot surrender, the second best option is to hit in those situations. So how come we recommend using a strategy while also stating that there’s no chance of winning long term. The rationale is actually based on simple math – the smaller the house edge for a casino, the more monetary swings will there be. Let me put it this way. When you play jackpot slot machines in brick & mortar casinos, they have a ridiculously high house edge. Somewhere around 30% is my guess. So every time you place a $10 bet, they take $3 and never return it. You are out of that $100 in approximately 33.3 spins. With blackjack it’s very different, especially when applying basic strategy. The house edge can be minimized to 0.18% when playing certain variations. When you place that $100 now, the casino only expects to have a net win of 18 cents. Minimizing house edge means that you’ll actually end your sessions as a winner way more often. So use the chart we provided above and enjoy winning at bitcoin blackjack. Any strategy that involves going with your gut and avoiding basic math is bad and should be dismissed. We know that it worked that one time, but the key here is to think long term. If you want to have a shot at having consistent winning sessions, basic strategy is the way to go. Ben Campbell crushing the table. 21 is a must watch movie for any blackjack lover and is based on real events. 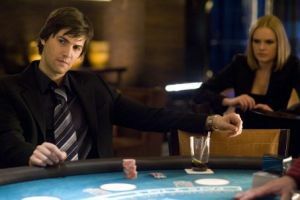 Ever since the movie “21” aired we have seen an increase in interest of card counting. Even though the movie was based on a true story about the notorious MIT team, the chance of actually being able to card count in today’s environment is pretty much non-existent. This is mainly because of shuffling machines that automatically re-shuffle the deck. Sure, there are several live dealer games where individual shuffling is offered, but card counting won’t work here either. To be able to profitably count and adjust your bets it is important that you get to a high count deep in the 6 or 8 decks that are used. This is impossible online, since the shoe is changed when penetration reaches around 3 decks. Most bitcoin casinos you see on this page are also accessible from mobile devices. If you are looking to play blackjack on iPhone, iPad or Android, we recommend doing so at 7Bit Casino for a number of reasons. We won’t even go into the obvious ones, such as their reputation and quick withdrawals. Rather the main reason to play here is their game variety. You have Net Entertainment, MicroGaming and SoftSwiss proprietary games under one roof. Should you change your mind and crave some mobile slots, they will be available within the same mobile app. CloudBet is one of the finest bitcoin gambling sites. They have a nice selection of RNG and live dealer games. You can choose between dealers from 5 locations based on Your preferences and maximum bet per box is a quite impressive 10BTC. New players can grab up to 5BTC in welcome bonuses, although You won’t be able to use these funds playing BlackJack games, as they are excluded. It’s only worth it if You plan on playing some slots on the side. Withdrawals are processed within 24 hours, but usually this only takes around an hour. US players are welcome to play all blackjack games available on the site including live dealer ones. 7Bit Casino is a gorgeously designed bitcoin casino that utilizes platform from SoftSwiss. Their game offerings include titles from NetEnt, MicroGaming, BetSoft, Amatic, Endorphina and SoftSwiss very own proprietary slots, and tables games as well. There’s not shortage of blackjack games here considering the software providers that cooperate with the casino. Those looking to play with live dealers will be stoked to hear that Ezugi and Net Entertainment games are available. Ezugi specializes in providing games from studios all over the world while NetEnt have a unique common draw variation in full HD video stream. It’s one of the simplest card games to learn, but it can be fairly complicated to play every hand in a correct way from math point of view. Lets start with the basics though. The goal of blackjack is to beat the dealer by either reaching a higher point score than them or having them go over 21, in which case all players with live hands at that moment win. Below you will find a proper step by step guide to the gameplay exactly as it will happen when you play for bitcoin at an online casino. Pick your preferred chip denomination and place them on the betting box. Depending on the game variation played, you will be able to play anywhere between 1 and 5 boxes at the same time. Once this is done, you can hit the deal button. Dealer will now proceed to deal cards to all participating players on a card by card basis. In most variations he will also place an open card for himself, but this may vary depending on the game type. Remember that in blackjack the highest point score is 21, but going over means losing the bet right away. Often it’s better to be cautious than to risk it, but basic strategy is always the perfect way to play. Unless you have gotten a blackjack dealt right away, meaning an ace and a face card or ten, you will now be offered with multiple options on how to continue with the hand. You are free to take your time when playing online, so there’s time to refer to the basic strategy chart that we posted above. When playing with live dealers there only are around 8-10 seconds for every decision though. I recommend starting out with the computerized “RNG” variations to avoid any confusion. Stand – remain in play with the current point score and move on to other hands or let the dealer play his own if there are no others. Hit – take another card to improve your point score. Remember that going over 21 will result in the hand being over and you losing the initial stake. Double Down – doubling your wager and receiving another card. Normally you are only allowed to take one card. Doubling is often performed when your two card point score is 10 or 11 and the dealer holds a bad card such as a 5 or 6. Surrender – some blackjack variations will allow you to surrender while others won’t. The option allows you to recoup half of the initial stake and forfeit the hand. It’s very useful in scenarios where you hold a volatile point total like 13 or 14 and the dealer has a ten. Surrendering is never allowed against a dealer’s ace. Split – if the two initial cards you are dealt are of equal value (8-8 or K-T), you are allowed to split them thus creating two separately playable hands. Some game types allow 3 or 4 re-splits as well. Once all hands have gone through the decision-making process explained above, the dealer will draw cards to his own hand. He does so until the point score reaches at least 17 or goes over 21, in which case everyone still playing wins. 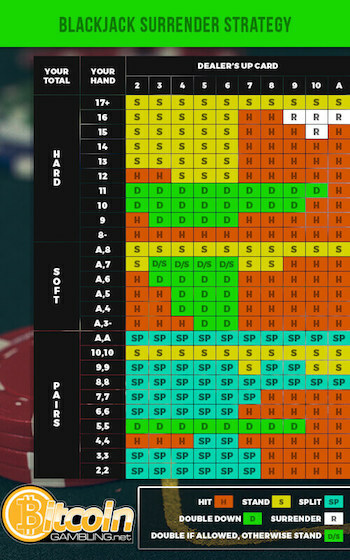 In some game variations, the dealer will hit on soft 17 (soft point scores are those consisting an ace). This is always bad for you when it comes to odds since that’s an extra shot for the dealer to make a higher point score than that. Whenever the dealer is given an ace as his first hole card all players at the table are offered insurance. In this case, you are insuring your wager against the dealer actually having a blackjack, which will happen around 30% of the time in a 8 deck game. Typical insurance payout is 2 to 1, so this is not a good proposition for the players and thus we always recommend that you avoid taking it. All winners are awarded with an even money money payout whenever they manage to beat the dealer. So a $100 bet would return $200 total with an extra hundred being profit. The only exception to this is getting a natural hand of blackjack dealt with the first two cards. In this case most game types award a payout at 3 to 2 odds so that same $100 bet would return $150. Whenever you and the dealer have an equal point score, after all card drawing is said and done it’s considered a push. You neither win or lose and your initial bet is free for the taking or being rolled over for the next hand. This is also the case with blackjack vs blackjack situations. In regular game types, blackjack is always the king and beats 21. In a scenario where you get it and the dealer manages to get 21 with multiple cards, you will still be paid at 3 to 2 odds.